The Infrared toolbox provides many tools for working with infrared signals. 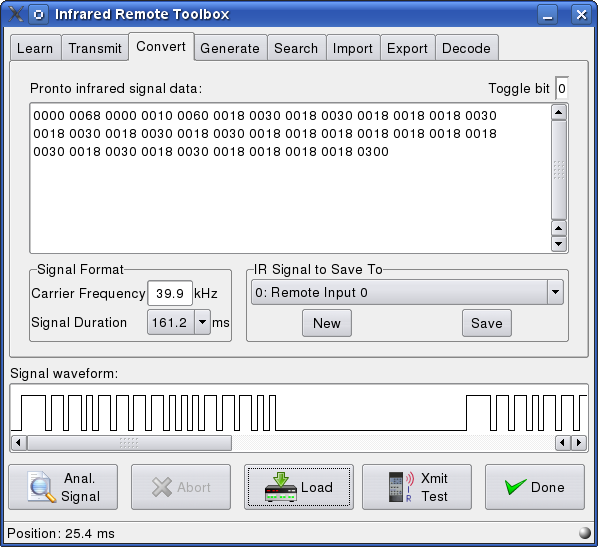 There's a tool for learning infrared signals transmitted by your remote control. Another tool will convert pronto codes. You can also generate infrared signals for a number of standard protocols by entering a system and a command code. 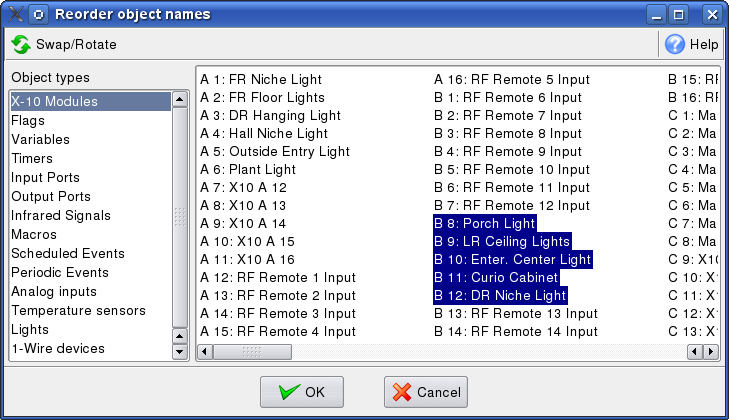 Another tool can automatically transmit a whole sequence of these code to help you find special infrared codes that may not be available on your remote control. The infrared toolbox can also be used for transmitting infrared signals. Finally the toolbox allows you to import and export infrared signals. The signal waveform graph gives a graphical representation of the infrared signal. Some simple time measurements can be done by clicking the mouse in the graph. The status bar will display the time from the start of the signal. The feature that reads a data file into variables needs a definition file that specifies which value belongs in which variable. HomeVisionXL has a built-in editor to create and maintain this definition file. Any changes made are active immediately without the need to shutdown and restart the HomeVision application. To effectively use variable indexed object access, the objects need to be in a specific order. If the requirement to use an index variable was not planned from the beginning it can be a lot of work to get the objects in the right order at a later time. When some object has become obsolete, it is not possible to delete the object unless it is the highest numbered of its kind. 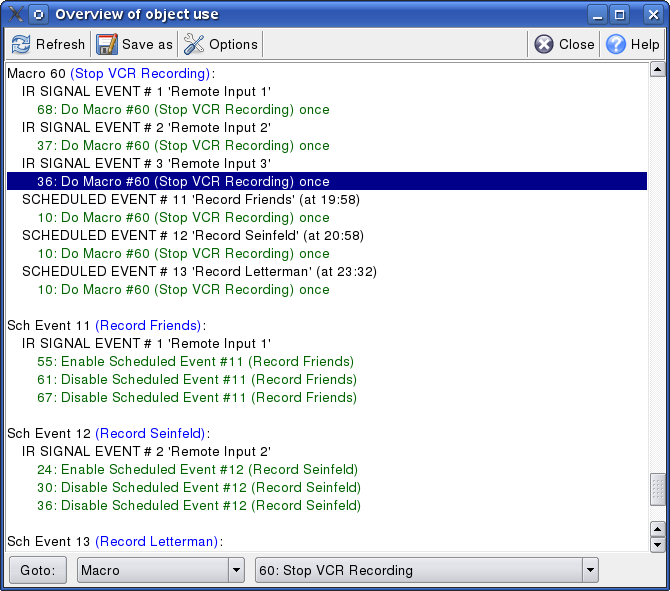 Both these problems can be solved by the object reordering tool available in the Other menu of HomeVisionXL. 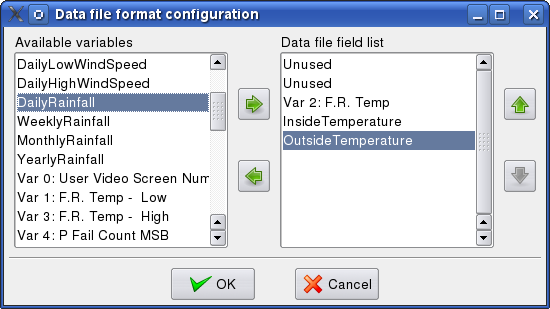 The user can select objects and move them to the disired location in the list. The selected objects are removed from their original location and inserted in the new location, keeping their relative order. The tool will automatically update all references to the changed objects in the action code as well as in the custom TV menu system, the custom TV menu page and the HVAC custom macros and variables. In the example shown on the picture the selected objects were originally modules A-3 through A-7. By simply moving these modules to another location all X-10 modules between A-3 and B-12 have changed position and as a consequence they will all get a different module ID. For objects like X-10 modules and input and output ports this is usually not desired. In those situations it is almost always better to select two or three objects that need to change position and click the "Swap/Rotate" button. The first selected object will move to the location of the second, which in turn moves to the location of the third, and the last selected object moves to the location of the first object in the selection. If this is done with only two objects selected, they will effectively swap positions. All the unselected objects are not affected and therefor their module ID does not change. After using and updating a schedule for some time, some objects have lost their usefulness. To check if those objects are still referenced somewhere in the schedule you could use the "View Schedule" command and search for the specific object. But this can get very tiresome if you want to check a number of objects. To make this job easier, a "View Object Use" tool has been added to the program. This tool will list all locations where objects are referenced. It can even give details on how the object is being used.